Runners from Aycliffe Running Club took part in the Tees Barrage 10k earlier this month. 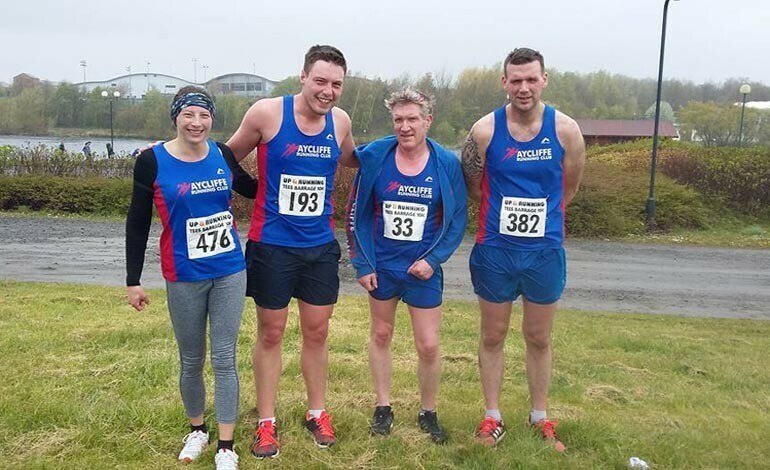 Five Aycliffe competitors were among 405 runners in the Stockton race. First home for the club was Michelle Zamir in a speedy 00:44:50 (position 83rd overall), she was followed by Rob Jayne in 00:45:07 (position 85th), Dave Blewitt in 00:46:47 (position 110th), Stephen Smith in 00:48:08 (position 130th) and then Sam Elwell in 00:55:17 (position 250th). Pictured (above, left to right) is Michelle Zamir, Rob Jayne, Dave Blewitt and Stephen Smith.